Put aside your preconceptions of the turmoil in the Middle East. Clear your mind, for a moment, of those images that have come to define the Arab-Israeli conflict: film footage of Palestinian suicide bombers clutching Kalashnikovs while reciting from the Koran, ambulances racing from the site of the latest bomb blast in Israel, Israeli tanks bearing down on youths armed only with stones, vigilante settlers claiming divine right, scenes of shuttle diplomacy and party-political posturing. Listen here to the voices of ordinary Palestinians and Israelis whose lives are being torn apart by the vicious cycle of violence and revenge fuelled, internally, by the fight for control of land and, externally, by international strategic interests. Some have lost children, others have lost their homes. Some are engaged in simple humanitarian work, others are committed to acts of political protest, lobbying for peace, tolerance and respect for human rights. Many are working together, Israeli alongside Palestinian, and suffering serious reprisals for taking such a stand in the prevailing political climate. They speak out because they fear that the voice of reason and justice is being lost in the wilderness of growing political extremism. At a time when the region looks further from peace than ever, what they say may challenge your view of what is going on in the Holy Land. Two months before she died, 14-year-old Smadar Elhanan cut her dark hair into a short crop. She knew her father loved her hair long. So, to disarm him, she crept outside the window of their home, tapped the glass, put her head to one side and smiled. ‘It was her way of making a statement of her independence,’ recalls her father, Rami, a graphic designer, as he sits in the bright sunlight of a Jerusalem morning. ‘Her elder brothers used to tease her because she was such a good student. But she knew what she wanted,’ says her father. ‘She wanted to be a doctor.’ Smadar also loved to dance. On the afternoon of September 4, 1997, she and her best friend, Sivane, had an audition for admission to a dance academy. That morning, Smadar had argued with her mother when she said she intended to go and buy school books in a shopping precinct in the centre of Jerusalem before the audition. You might imagine that Smadar’s death would incite Rami and Nurit to support the extreme measures Ariel Sharon has implemented in the name of national security since taking over as Israel’s prime minister a year ago, to form the most right-wing and bellicose coalition government in Israeli history. Quite the opposite. Rami argues that if he had to endure the oppression, humiliation, discrimination and injustice meted out on a daily basis to the Palestinian people in the occupied territories, such treatment and loss of hope would incite him to violent retaliation. ‘It is very hard, but I make a sharp distinction between my own feelings of hatred and anger, and a realistic conception of what is going on. And I know that if I were on the other side of the fence, I would resist the occupation too. People who don’t have power do what they can. What they can is terror. I don’t say it is right. It is a horrific weapon,’ argues Rami, who blames corrupt and failing politicians for letting it come to this. Both Rami and Nurit were raised to believe that the birth of the state of Israel as a Jewish national homeland was an act of self-preservation. Rami’s father had survived Auschwitz. His grandparents, six aunts and uncles perished in the Holocaust. Nurit’s grandparents moved to the Middle East from Russia after the first world war. But Rami, 52, dates the beginning of his political awareness to his time as a young army conscript following the 1967 six-day war and, later, as a reserve soldier in the 1973 Yom Kippur war. ‘I saw that war was not about honour and glory, but agony and suffering,’ says Rami. After a period of deep despair following Smadar’s death, Rami was approached by another Israeli father whose son had been killed by terrorists. Yitzak Frankenthal’s son Arik was kidnapped and killed by Hamas militants while completing his military service in 1994. After a meeting with the then prime minister Yitzhak Rabin – assassinated at a peace rally 16 months later by one of his own countrymen – Frankenthal contacted hundreds of other bereaved parents, Israeli and Palestinian, to form a lobby group for reconciliation, tolerance and peace. ‘If parents who have lost their children paid the highest price anyone can, are able to put aside their feeling of revenge and hatred and talk about reconciliation and compromise, then, I believed, we could show everyone can,’ says Frankenthal. The group now comprises nearly 200 Israeli families belonging to an organisation called the Parents’ Circle and a group of 140 Palestinian families, some of them parents of suicide bombers, in the Gaza Strip affiliated to the political party National Movement for Change. Both groups jointly organise educational campaigns and talks, and lobby politicians to get back to the negotiating table. Some risk being derided as traitors, or worse. Frankenthal, an Orthodox Jew, receives regular death threats from Israeli extremists who abhor any contact with Palestinians. As the situation has deteriorated, both groups have found it increasingly hard to meet each other. But they continue to speak publicly, organise poster campaigns and discussion groups and have staged displays of hundreds of coffins in public spaces to make people stop and reflect on the human cost of the conflict. ‘After Arafat and Rabin shook hands at the start of the Oslo peace process in 1993, many thought we were in for a honeymoon. Ten years on, it is clear this was never about a marriage of two peoples but a divorce. As with any divorce, it is deeply painful and involves both parties giving up a lot of their dreams, making sacrifices so they can get on with their lives and live in peace,’ says Frankenthal. Such sacrifices, he and other like-minded Israelis argue, should be based on a greater understanding by both sides of each other’s history and suffering; an appreciation by the Palestinians of how deeply the catastrophe of the Holocaust is embedded in the Israeli psyche, and an understanding by the Israelis of how great a disaster the founding of the state of Israel in 1948 – referred to as the naqba – was for the Palestinians. Since joining the Parents’ Circle, Rami has spent much of his spare time touring schools and talking to teenagers. He starts off by talking about Smadar and then continues with a simple story. ‘I tell them: imagine there is a house with 10 rooms and in this house lives Mohammed with his wife and children. One stormy night there is a knock at the door and there stands Moishe and his family, in a very bad shape. Moishe tells Mohammed he used to live in the house 2,000 years ago and proceeds to move in, at first taking over eight rooms and eventually moving into the remaining space. That remaining space, I say, represents the occupied territories. I tell the teenagers that when they go into the army, they will be called on to spend much of their time defending the rights of Jewish settlers in that space. In the garbage-strewn streets of the Gaza Strip, one small face stands out among the posters plastered on the walls of shahid, or martyrs – those killed in the recent violence, some of them suicide bombers. It is that of a baby girl with a slightly startled look. She is Iman Hajjo and was just three months old when she was killed as Israeli tanks shelled her grandmother’s house in the Khan Yunis refugee camp, several kilometres from her own home at Dir al-Balah. Iman escaped injury at first, lying in her cot as the first two rounds of mortars struck around 10.30am on May 7 last year, severely injuring her grandmother and two young cousins. But when a third grenade landed at their front door, as Iman’s mother, Suzan, tried to escape clutching her child, the back of the baby’s head and shoulders was blown away and part of one arm was severed. Suzan’s lung was punctured by shrapnel and she suffered severe chest and leg injuries. Iman’s father, Mohammed, turned on the television news at 11am that day and he watched, in horror, images of his wife and her family being carried on stretchers to an ambulance. When it was reported that a baby named Iman had been killed, Mohammed collapsed. Twenty other Palestinians, including schoolchildren playing outside and medical personnel rushing to their aid, were also severely injured. Israeli reports claimed the attack was in retaliation for mortars fired from Khan Yunis on a neighbouring Jewish settlement, which had caused no injuries. The military later stated that their retaliation had been ‘excessive’, and Sharon apologised that ‘an Arab baby had died’. Mohammed, whose forebears were fishermen in an area north of the Gaza Strip before being forced to flee in 1948, says that immediately following the death of his baby daughter he wanted revenge. ‘I felt so angry and confused. I thought, if they have killed my child, I have the right to do the same. When an Israeli child is killed, it is on the front page of newspapers around the world. When one of our children is murdered, little attention is paid.’ According to the Israeli human rights organisation B’Tselem, in the 14 years from the beginning of the first intifada in 1987 to December 2001, a total of 443 Israeli civilians have been killed in the conflict, including 50 children. Over the same period, 2,137 Palestinian civilians have been killed, among them 432 children. The prospect of peace and reconciliation in the current climate certainly looks bleak. At the time of writing, the temporary lull in hostilities that brought the latest US Middle East envoy, Anthony Zinni, back to the region in early January to broker ceasefire talks has come to an end. Most believe the region will continue to spin further in its vortex of bloodletting before a new line in the conflict is drawn. Sharon’s tactics of targeted assassinations, declaring Arafat ‘irrelevant’, strafing Palestinian towns and villages with helicopter gunships and bombarding key Palestinian Authority installations, plays directly, and some say deliberately, into the hands of the Islamic extremists. Allowing them to move into the power vacuum, it increases the violence, in turn used to justify an ever stronger crackdown by the Israeli military. The position of extremists on both sides is uncompromising. The militants of Hamas and Islamic Jihad refuse to recognise Israel’s right to exist; Israeli extremists want their Jewish homeland extended east to the River Jordan. Failing this, they want Palestinians in the occupied territories confined to an ever smaller space. This, in effect, is what has been happening over the past 10 years. In violation of international law and the Oslo accords of 1993, the number of settlers who have moved into the West Bank, Gaza and annexed East Jerusalem since then has more than doubled to about 400,000. Many settlements have been built in such strategically crucial locations – and connected with a system of roads, referred to as ‘security highways’ – that they have broken those areas of the occupied territories to which Palestinians are relegated into ever more crowded, disconnected islands with limited supplies of electricity and water. In addition, there has been a sharp increase in the number of land annexations, expropriations and demolitions of Palestinian homes, justified through a complicated maze of bureaucracy and zoning laws. At the heart of such action is a battle over demographics. Despite a chronic housing shortage among the rapidly growing Palestinian population, they are denied permission to build on the majority of land in the West Bank. Permits to build on land deemed eligible for development can take years to acquire and cost the equivalent of thousands of pounds, putting them beyond the means of most. Houses built without permission are served with demolition orders; an estimated 17,000 Palestinian homes have been destroyed in the occupied territories since 1967, and in the past year the demolition programme has accelerated. To highlight the misery this causes, a small number of Israelis, calling themselves the Israeli Committee against House Demolitions, have formed themselves into an action group that mobilises when they are alerted by Palestinians that a demolition is imminent. Often joined by activists from another pressure group, Rabbis for Human Rights, protesters sit in front of bulldozers to try to stop demolitions. Although they do not succeed, where possible they subsequently help fund and physically rebuild the destroyed homes. The founder of the committee, Jeff Halper, a former professor of anthropology, smoothes out map after map to illustrate what he describes as the ‘matrix of control’ being imposed on the occupied territories through the programme of settlements and demolitions. He draws an analogy with a prison where inmates may occupy the majority of the space but are still effectively confined because wardens command those areas that constitute the bars and walls. This makes more sense after visiting Palestinians whose houses have been torn down and seeing their proximity to settlements and ‘security highways’. Salim Shawamreh says he spent the equivalent of around £7,000 applying for permission to build on a plot of land he had bought in the Arab village of Anata on the outskirts of East Jerusalem. The process dragged on for years. Endless objections were raised, including the assertion that the land was a ‘green area’ and no development was allowed. As Salim’s family grew, he built it anyway. Shortly after he, his wife and six children moved into their home in the summer of 1998, it was surrounded by soldiers and police sharpshooters. Tear gas was tossed through the windows and bulldozers moved in to demolish the building, despite attempts by Israeli activists, who were beaten and arrested, to stop the destruction. Twice more, Salim rebuilt his home with the help of Israeli volunteers. In a village on the outskirts of Hebron, another father cradles his baby daughter as he shows me the site where his home was demolished two years ago. Despite documents that Atta Jaber says prove his family has owned this land in the Baqa’a valley since the days of the Ottoman empire, the Israeli army declared it had the right to confiscate it on the grounds that it was needed to protect the security of the nearby settlement of Kiryat Arba. When Atta protested, he and his wife, Rudaina, were beaten in front of their children, Atta was imprisoned, their fruit trees cut down and their home demolished. When they rebuilt a house nearby with the help of international aid organisations, settlers attacked it with pickaxes, scrawled graffiti on the walls and defecated in the basement. As Atta shows me the destruction caused, a bulldozer and an armoured car from the nearby settlement circle the house, then parks less than a hundred yards away, and their drivers sit watching us through binoculars. ‘I am very, very pessimistic,’ says Rami Elhanan. ‘Now we have a government in Israel that does not want peace. It concentrates its main efforts in trying to show that Osama Bin Laden and Yasser Arafat are the same. And if, as it argues, they are, there is no reason to negotiate. Sometimes I feel like a boy with his finger in the dam, talking about peace when the flood of violence and hatred has already swept away the wall. It is a sentiment echoed by others I speak to, many of whom are convinced that the cycle of violence will only be broken by strong international intervention, and not just by the United States. ‘Europe’s position falls far below expectations. The Europeans could do a lot more, but seem constantly to be hiding behind the skirts of the Americans,’ said one Palestinian businessman. Talking by the light of a gas lantern in Gaza City, blacked out at night because of an Israeli strike on the area’s only electrical power station, Nasser Warj Agha laid more responsibility at Britain’s door. ‘The British are partially responsible for creating this mess; let them show more courage in helping to clear it up.’ Nasser was recently invited to visit London, Germany and South Africa on a speaking tour with a group of other bereaved Palestinian and Israeli parents. It never happened. Most Palestinians are denied permission to travel beyond the confines of their refugee camps in Gaza, let alone leave the country. The crippling effect of restrictions on movement of the Palestinian population is impossible to overestimate. The system of checkpoints, curfews and unmanned roadblocks – deep trenches and massive soil ramps preventing vehicles from passing, often from one part of a town or village to another – now holds just over 3m people in a complete stranglehold. The resulting sharp rise in unemployment, hunger and hardship among the Palestinians has created a pressure cooker of resentment, rage and thirst for retaliation. Some senior Israeli officials admit that the system of closure does little to contribute to security. Terrorists can easily evade detection by trudging across the open hillsides of the West Bank, entering Israel through a rabbit warren of dirt tracks. Some admit that closure has more to do with control than concern for safety. After crisscrossing the West Bank in buses and taxis and witnessing the casual but consistent humiliation of Palestinians at the Israeli army checkpoints that exist on every main thoroughfare, it is hard to disagree. One journey from Hebron to Jerusalem that should have taken less than an hour turned into a tortuous three-hour ride across rough hillside tracks, which had one elderly woman vomiting with dizziness after our bus was turned back at one checkpoint because its driver and most passengers were Palestinian. In recent months a growing number of Israeli Army reservists have refused to serve in the West Bank and Gaza Strip. Those who refuse, some of them senior officers in elite combat units with proud war records, face prison sentences for taking such a stand. As reports of abuses of Palestinians at roadblocks have grown, a group of around 70 Israeli women has formed an organisation called Machsomwatch to monitor the action of soldiers and police. The women mount vigils in small groups at principal checkpoints throughout the West Bank in the early morning and late afternoon. Judith Keshet, one of the three founders of Machsomwatch, believes the women’s presence holds those at the checkpoints accountable, briefly, for their actions. Practices the women regularly observe include ad-hoc strip-searches, Palestinians being forced to sit in cars or buses for hours with their windows open in the pouring rain and shut in extreme heat, or told to stand for long periods with their hands in the air after having their ID cards confiscated. Where possible, the women intervene, pleading with soldiers and police to treat those they stop with more dignity and respect. This sometimes elicits verbal abuse. Keshet describes the women’s action as ‘a drop in the ocean’. But, she says, ‘in these dark days, every drop counts’. More serious abuses are monitored by doctors belonging to the Israeli pressure group Physicians for Human Rights, involving Palestinians urgently seeking medical care such as kidney dialysis and cancer treatment, or women in labour being denied safe passage. Since September 2000, the group has recorded 221 instances of ambulances bearing such patients being turned back at checkpoints, resulting in 29 deaths. The group consistently lobbies the Israeli High Court for soldiers held responsible for refusing to let patients pass through checkpoints to be arrested and tried. One such case involves the treatment of a young expectant mother called Fatima Abed-Rabo, who was stopped at a checkpoint with her husband, Nasser, as the couple tried to make their way to Bethlehem for Fatima to give birth last October. It was early in the morning when Fatima, then seven months’ pregnant, started to feel the first pains of labour. Certain that his wife would give birth within hours – the couple’s daughter, Arij, had been born two months prematurely – Nasser convinced a neighbour in their West Bank village of Wallaje to lend him the truck he used for transporting chickens, to get his wife to the nearest hospital in Bethlehem. The couple had been trying for a second child for several years and undergone fertility treatment, Nasser says, after he suffered sexual problems resulting from abuse during a two-year spell in an Israeli jail. 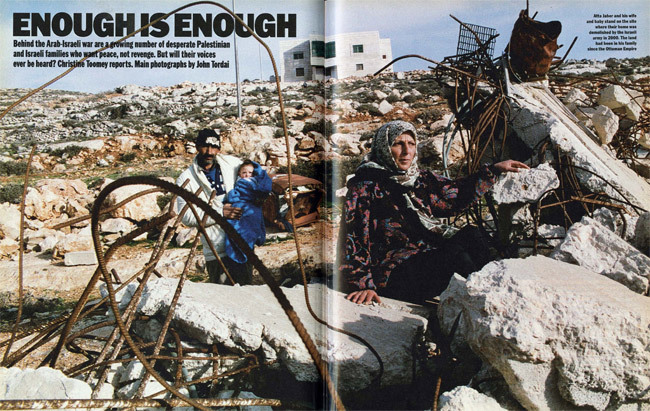 ‘When Fatima became pregnant,’he says, ‘we were so happy, we celebrated by replacing the tin sheeting on our home with a concrete roof.’ But when the couple, accompanied by Nasser’s mother, arrived at the Israeli army checkpoint 100 yards outside their village, they were told to go home, despite the fact that Fatima had started haemorrhaging. In desperation they returned to the village and transferred to a taxi in case it might be allowed to pass. Again they were refused permission. After driving back some way, they abandoned the car and started walking across the fields to avoid the checkpoint and attempt to reach Bethlehem by foot. Their baby son was small, but alive. After stumbling across the rocky hillsides for just over an hour, they flagged down a car, which drove them to the Holy Family hospital. Their baby weighed 1.4kg (3lb), his condition critical. He was blue, suffering from exposure. Seven hours later, he died.